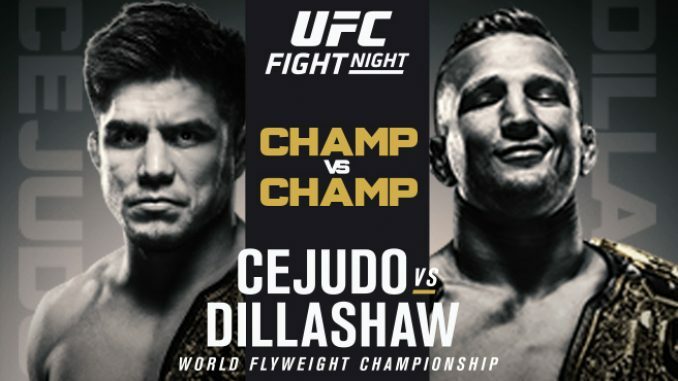 John Pollock's coverage of the UFC's debut on ESPN+ from the Brooklyn with Henry Cejudo defending the flyweight title against T.J. Dillashaw. Welcome to our coverage of the UFC’s debut card on ESPN+ from the Barclays Center in Brooklyn, New York. We have a POST Show late tonight with Phil Chertok joining me to review the card. Stewart was the third opponent for Rencountre after Randy Brown fell out due to injury and Dwight Grant was not licensed by the commission in New York. Rencountre connected with his left hands immediately and was struck low by Stewart. The fight resumed and Rencountre took him to the mat with back control. Stewart tried to defend and was rolled and submitted with a rear-naked choke. This was the sixth first-round stoppage for Rencountre. This was a very good fight and more so, a solid performance from Neal. The southpaw was patient with his left hands but made them count when he attacked Muhammad. Neal showed great takedown defense unofficially stopping five of Muhammad’s attempts. In the second round, Muhammad started to find his rhythm through body strikes but was susceptible to the left hands after attempting to counter and eating a flurry. In the third, Neal dropped him by the cage and later scored with a strong head kick that wobbled Muhammad. If you went 10-8 in the third it was justified. Both men had four-fight win streaks coming into the fight as Neal earned his third UFC win against a quality fighter. Bermudez had lost four in a row and was returning to lightweight for this fight. Edwards was looking in the first round and then the dynamic completely switched. Edwards got tired and Bermudez implemented his wrestling and was relentless with his top pressure and submission game. Bermudez turned the tide midway through the first to take that round back. In the second and third, Bermudez dominated him. I gave him a 10-8 for the third round. He constantly worked for submissions and Edwards seemed to have nothing left. After the fight, Bermudez announced his retirement after 17 fights in the UFC and competing on TUF Season 14 in 2011. This was his first win since August 2016. Bautista replaced John Lineker last week for this fight. He was an enormous underdog at +435. Sandhagen dropped him with a beautiful flying knee and started a surge of submission attempts. Bautista lifted and slammed Sandhagen onto the mat but landed in an inverted triangle. Bautista escaped but Sandhagen persisted and cinched in an armbar from his back for the win. Sandhagen said he was on a different level than a lot of these guys. This was his third win in the UFC and fourth in a row. Menifield had an eight-second knockout win on Dana White’s Tuesday Night Contender Series in 2017. He came out and dropped Moreira with a right hand after catching a kick. Moreira came back and clinched against the cage. Menifield got off the cage, Moreira attempted a spin kick and was dropped with a looping right hand and finishes him with strikes. Menifield improves to 8-0 and this was his seventh first-round stoppage. Calderwood had another strong outing fighting at flyweight. The first round was arguably the best round she has fought with a dominant display of grappling. Calderwood stopped Lipski’s strikes and took her down. Calderwood threatened with a choke, arm triangle, and an armbar attempt. The second and third were slower rounds but Calderwood won the second with her striking, and the third with her submission attempts towards the end. Lipski had good submission defense but was reacting and defending throughout the fight and couldn’t dictate anything. This was Cerrone’s 30th fight in the UFC since February 2011. Hernandez was aggressive at the start and Cerrone stopped his momentum with a takedown and powered him to the mat. Cerrone took over with counters, knees to the body and his right hand. Cerrone was destroying Hernandez with knee strikes to easily take the first round. In the second, Cerrone chopped away with leg strikes and dropped Hernandez with a head kick and finished with strikes. Cerrone looked excellent and improves to 35-11. Roberson was a late replacement for Ion Cutelaba. Roberson nearly stopped Teixeira when he nailed him with several elbows to the sides of the head, got on top and continued with the strikes. Teixeira survived and came back and got on top to mount Roberson. He attempted an arm triangle, Roberson defended, and then Teixeira re-applied and submitted him. Teixeira improves to 28-7 with his 11th win in the UFC and first since December 2017. This fight had a lot of attention because of the domestic violence case involving Ostovich. The first round was won by Ostovich who was able to take VanZant down three times. They were stood up once for inactivity but Ostovich just took her down again. VanZant tried for a leg lock late in the round but was unsuccessful. Ostovich took her down again in the second, lost position and VanZant snatched the back and attacked with strikes. Ostovich was about to slip out but VanZant had control of the left arm and heard her arm pop and she tapped. VanZant was coming off two losses and this was her first win since August 2016. She said she would like to fight on the first ESPN card in Phoenix next month. This was a grappling exhibition for three rounds with high-level exchanges throughout the fight. This was a rematch from 2014 that Benavidez won by decision. Benavidez landed his best strike in the first round with a left hand and threatened with the guillotine. Ortiz had his best round in the second after slamming Benavidez and going for a choke. In the third round, Benavidez took Ortiz down, Ortiz transitioned to his back but was reversed. They continued with Benavidez having the grappling advantage and not letting up for a second. It might not be everyone’s favorite style of a fight but this was grappling at a supreme level and Benavidez won the fight 29-28. Benavidez has now won 7 of his last 8 and it`s hard to deny him the next title fight if there is a flyweight division remaining. Gillespie dominated every second of this fight. He has a style that is frustrating but ultra effective and smothering in execution. Gillespie took him down five times in the first round and won the round based on control. In the second, he took Medeiros down and started attacking and delivering damage. He mounted Medeiros twice and lit him up with ground and pound getting the stoppage with one second left in the fight. Gillespie absorbed one strike in the fight. Gillespie is 13-0 and 6-0 inside the UFC. He is a big prospect at lightweight. Hardy was booed coming out. In the first round, Hardy was landing powerful strikes that Crowder needed to get away from and did when he got the fight to the ground. Crowder got side control and later jumped for a poor attempt at a guillotine and failed. Hardy landed a big right at the end and won the first round. In the second, Crowder started yelling at Hardy to trade and then ate an elbow. Crowder couldn’t take him down and was down on one knee when Hardy blasted him with an illegal knee. It was a clear-cut disqualification and the fight was over. The audience booed Hardy and cheered the announcement that Crowder won by DQ. This was a bad ending to the fight and Hardy came off terribly. Cejudo caught him with a kick to the chin and right hand and that was it. Cejudo never let him with follow up strikes and kept landing on him until MacDonald stopped the fight. Dillashaw was furious about the stoppage. Cejudo said he would face Dillashaw again at 135 pounds.